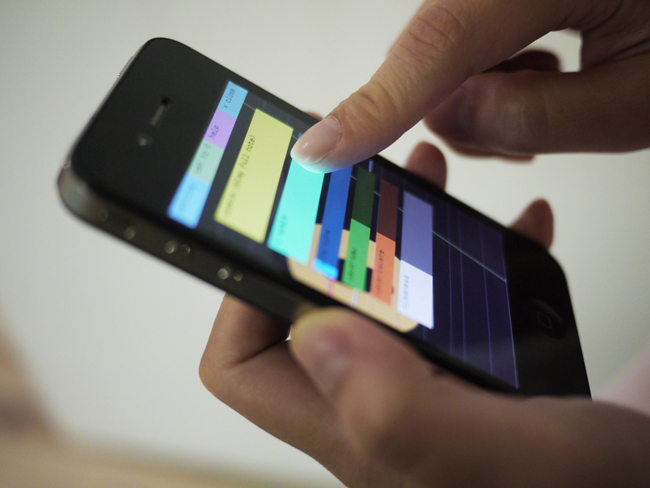 SoundGyro, an amazing new app that makes iPhone into a 21st-century theremin. Once iPhone4 was released, I wanted to try on the gyroscope as it gives more accurate position/orientation information than the accelerometer. I had the idea to create a theremin-like instrument that translates the hand position to musical notes…Using SoundGyro is simple, tap anywhere on the screen to start the sound, at this moment, there is no difference at where you tap, but I might add some more control for advance playing. Tilting the device upward and download to change the pitch. To move to the upper or lower octave, rotate the device, you can use up to +/- 3 octave. The rolling controls the volume. Amazing to think: In the SoundGyro app, every single movement in every single direction is registered with super-fine precision, with a different effect on the sound. And one beautiful detail in the app–which you can see in the video above–is how the phone’s screen seems like a lens onto a larger instrument interface, thanks to the gyro’s ability to track orientation. The key to the application is the greater sensitivity of all of the iPhone’s sensors–Chu actually tried to create something similar on both the iPhone 3GS and the Wiimote, but they didn’t work very well. Simply put, the iPhone 4 is probably the most advanced gestural sensor on the market right now, and that means apps can respond to fine motor movements in unprecedented ways. Chu tells Creative Applications that SoundGyro should be done in two months. We’ll update you when it becomes available. Chu writes to tell us that SoundGyro will be in the app store in about two weeks! It’s up in the app store now.